Chaz on the Possible "New" ATR Agreement Between The UFT and the DOE: More Bad News - ATRs Need a Chapter and a Chapter Leader!!! UFT Members should ask - no, demand - a chapter for ATRs. This failed once or twice in the past, but now that ATRs are having their rights negotiated without them, there should be a new demand to be represented. I also was told recently that the DOE Attorneys at 100 Gold Street, 3rd Floor, who do the 3020-a arbitration, have set up a new group to pursue ATR cases. I nominate Chaz, Eric Chasanoff. He and I worked closely together when I was at the UFT, and he is an amazingly fair, honest and direct person who knows the rules and is willing to stand up and say what is wrong and what needs to be changed. I have not asked him yet, but how about it Eric? The DOE And UFT Are Secretly Negotiating A New ATR Agreement- Without ATR Participation. 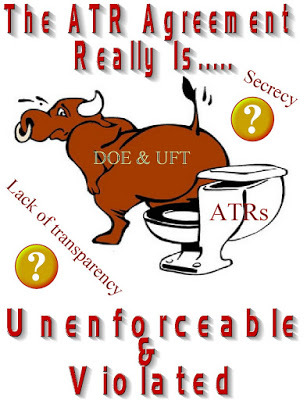 Once again, the DOE and UFt are secretly negotiating a new ATR agreement without ATR representation. While the negotiations are secret, there are leaks and here are some of the broad details of the new agreement. First, and foremost. ATRs will be assigned to one school for the 2017-18 school year. This will be a "forced placement" as the ATR has no say on the placement, which will be based on available vacancies of the assigned school in the ATR's content specialty. Second, the formal observation will be made by the assigned school but informal observations will be done by field supervisors who will have input into the final grade. Third, ATRs will no longer be subject to the more lenient "S" and "U" grading system but be evaluated under Danielson and the new teachers evaluation system. Finally, Appointed ATRs will be free the first year and reduced cost for the next few years after. However, the actual reductions have not been leaked out yet. I must note this incentive is similar to the failed incentive of this school year. What makes the DOE and UFT believe it will work any better next year is beyond me. My understanding of how the new ATR agreement will work is that most of the ATRs will be placed in Renewal or academically struggling schools where high teacher turnover, poor administration, and a high poverty student body with many "high needs" students are common. Since these are the schools that tend to have vacancies at the start of the school year. Furthermore, there is no "mutual consent" for the placement by the ATR, look for many of the placements to be in undesirable schools or hard to get to locations. In some cases, ATRs with few openings in their content specialty, like music or shop teachers will still be used as coverage teachers in schools that have such programs but no vacancies. Please note, since the negotiations have not been completed, some of the above information may change in the final ATR agreement.